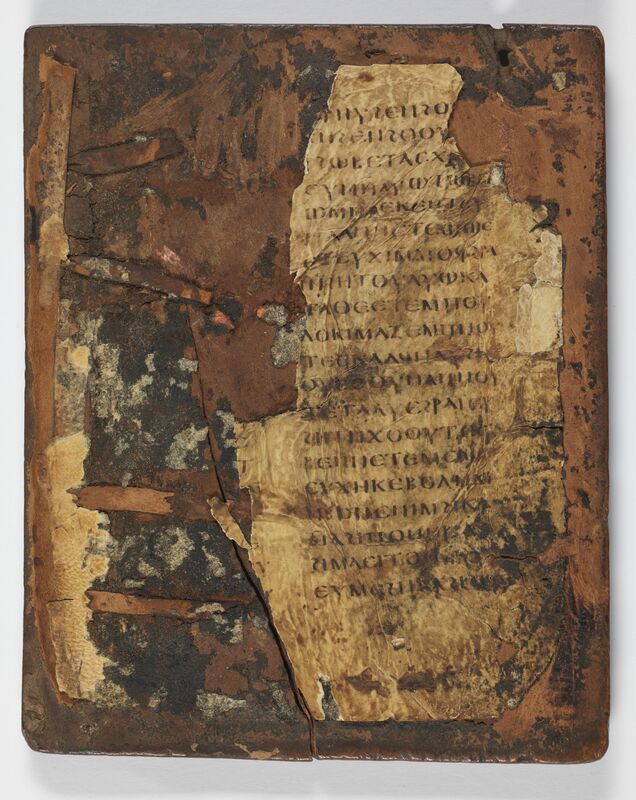 Parchment codex containing the Gospel According to Matthew 14:28-28:20 and Romans 1-1:1-2:3 in Coptic (Sahidic). 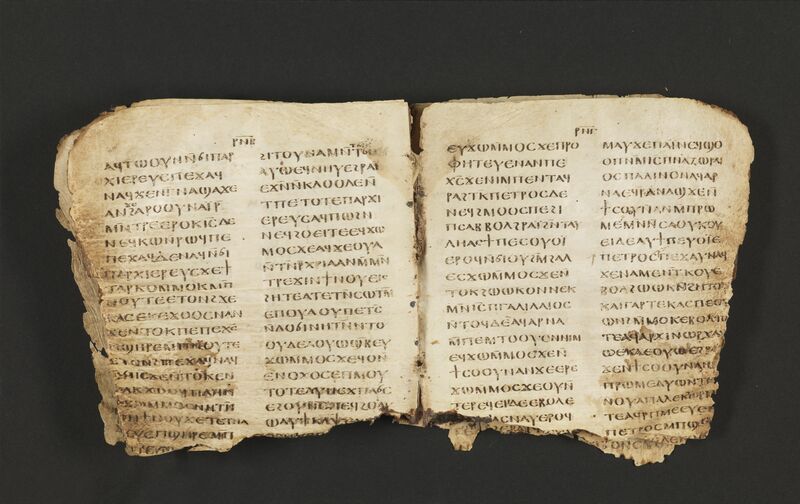 Description: P.Bodmer 19 is a well-preserved parchment codex containing the end of the Gospel according to Matthew and the beginning of Paul’s letter to the Romans in Coptic (Sahidic with some peculiarities). The codex was rebound in antiquity between two wooden boards. The outer edges of several leaves have been repaired with rectangular parchment patches. A letter from Louis Doutreleau to Victor Martin of 26 August 1956 mentions Phocion Tano’s delivery of a batch of books containing material by “St. Paul.” Robinson interprets this as a reference to P.Bodmer 19 and places the date of its acquisition as some point between July and September of 1956 (Robinson, The Story of the Bodmer Papyri, 43). CopistesThere are four different copyists in this text. The first scribe wrote Matthew and several corrections to it. The second hand wrote Romans. The third hand wrote at the time of the first mending of the codex, and rewrote small amounts of text on some pages (Matt xxi:19-23, XXIII, 1-7 & XXIV 4-13). The fourth hand rewrote numerous letters in Matthew and also wrote the title (page 5 of quire 1). Orsini has identified all four hands as Biblical Majuscule style (Orsini, “I papiri Bodmer,” 77). Without distinguishing between hands, Kasser also identifies the script of P.Bodmer 19 as Biblical Majuscule (Kasser, “Paleography,” 176). Dimensions: The width of the page is 12.8 cm. The height of the page is 15.5 cm. The ratio of the page (width/height) is 0.826. The writing is in two columns. The width of the written area is about 10.2 cm. The height of the written area is about 11.0 cm. There are 20 lines per page There are 48 extant folia. Quires: Kasser estimates that in antiquity there were between 12 and 20 quires and that the codex was more than 300 pages long. It underwent at least two repairs in antiquity (Kasser, Papyrus Bodmer XIX, 7-9). Only seven quires have found their way into the Bodmer collection. Of these seven quires, the first has only two sheets, almost completely blank. The other six quires are quaternions and are assembled in the classic flesh-hair, hair flesh, flesh hair, manner. Cover: At present the book block has no cover, but the last leaf of P.Bodmer 19 is pasted to the inside of one of two incised wooden covers. Although these covers enclosed P.Bodmer 6 upon its arrival in Geneva, it is clear that they belonged at one stage to P.Bodmer 19 (Kasser, Papyrus Bodmer XIX, 13, note 9). The exterior of the upper board is incised with a cross, and the exterior of the lower board is incised with ankh (☥) symbol. 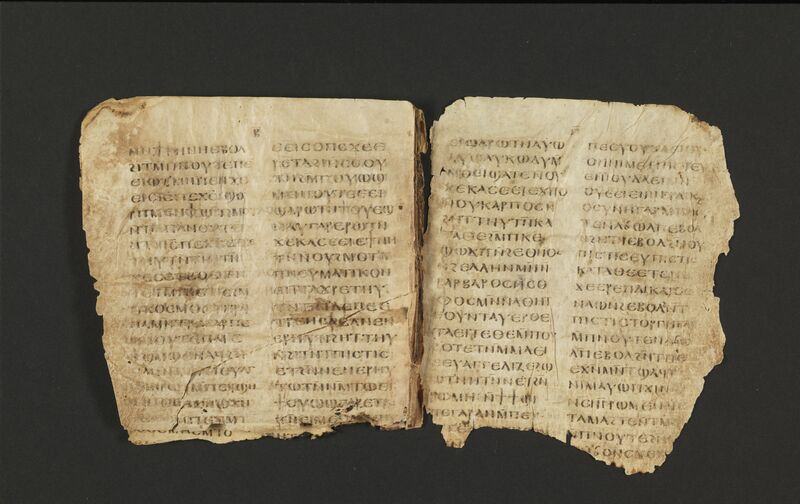 Binding: The original binding was not preserved. The present quires now present were were rebound using a link-stitch at two independent pairs of sewing stations. The thread is 1mm in diameter. On the folds of the third and fourth quires, there is a knot at the upper stitch. The lower stitch of the fourth quire has another knot. Paratextual features: The fourth hand, at the time of the second repair to the codex, added the title (page 5 of quire 1) ⲡϩ︥︤ⲁⲏ ⲛ︤ⲙⲉⲣⲟⲥ ⲙⲁⲑⲉⲟⲥ (“The last part of Matthew”). The copyist also employs the forked paragraphos and diples to mark end of Matthew as well as horizontal lines above and below title (Matt. XXVIII 18-20). Decorations: None, but see description of the wooden covers. 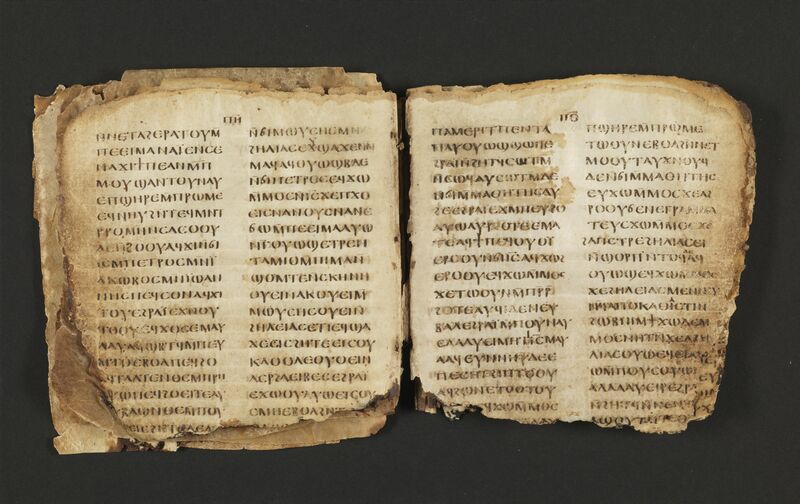 RésuméParchment codex containing the Gospel According to Matthew 14:28-28:20 and Romans 1-1:1-2:3 in Coptic (Sahidic). Kasser, Rodolphe. Papyrus Bodmer XIX: Évangile de Matthieu XIV, 28-XXVIII, 20: Épître aux Romains I,1-II,3 en sahidique. Cologny-Geneva: Bibliotheca Bodmeriana, 1962. Kasser, Rodolphe. “Paleography.” Pages 8.175-8.184 in Aziz Suryal Atiya (ed. ), The Coptic Encyclopedia, 8 vols. New York: MacMillan, 1991.